Cooking adventures in a small, closet sized, kitchen. - I came to realize that my meals were boring and that I had been eating the same few dishes over and over again for years. It was time for a change! I now spend my free time searching for, creating and trying tasty new recipes in my closet sized kitchen. Never miss a recipe! Subscribe to the email Newsletter! Asparagus coated in panko bread crumbs and parmesan and baked until golden brown and crispy. I have really been looking forward to spring and the fresh local asparagus and one of the first things that I wanted to make with it was some crispy baked asparagus fries! Ever since I discovered that you can coat vegetables in panko bread crumbs and bake them that they would become healthy ‘fries’ I have been doing it with pretty much every vegetable that I can get my hands on. Given that asparagus is already in perfect ‘fry’ shape it seemed only natural to turn them in fries and it couldn’t be easier to do so! You pretty much just need to dredge the asparagus in flour, dip in egg, coat in panko breadcrumbs and bake until crispy. All said and told you can be enjoying these healthy baked asparagus fries in about 20 minutes so you can make them whenever you want. 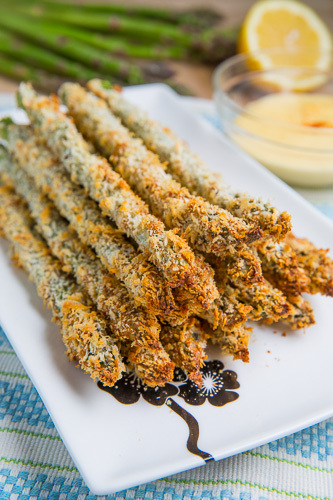 If you are a fan of asparagus, you will definitely enjoy these asparagus fries and they might just be that one new asparagus that you absolutely need to try this spring! Dredge the asparagus in the flour, dip in the egg and then into a mixture of the panko, parmesan, salt and pepper. Place the asparagus in a single layer on a wire rack on a baking sheet and bake in a preheated 425F/220C oven until golden brown, about 7-13 minutes. Get ALL 12 Closet Cooking eCookbooks in a bundle for 70% off! Enjoy some of the tastiest recipes from Closet Cooking along with exclusive cookbook recipes! Get the Cookbook Bundle Now! Oh how I want some of this asparagus today!!! Delish!!! Mmm what a simple, fun, recipe! I love asparagus, so I will love these! What a great idea! Yum! The local asparagus here in New England is probably the best in the world. Can't wait until it starts being on all the farm stands! This sounds delicious! I have to try this soon! Wow that hollandaise sauce looks like it would go perfectly with that crispy asparagus. Yum! Love this idea, plus look how pretty they look! Absolutely perfect! I could eat a whole batch of these! I love these asparagus, what nice idea with Panko!! I'm a big snacker and I'm always looking for healthy things to snack on. These asparagus baked fries are a great option. That crispy panko crust sounds awesome! I love asparagus and I love that you baked these rather than fried! And that they only take 20 mins! Total success! D: I may have just died. Love this! I think I could even give up traditional potato fries for this! Genius! Thanks for sharing! Makes me so excited about asparagus season. Made this – servied with an avocado/lime dipping sauce – absolutely wonderful! I have bunches of asparagus to eat up and bags of bread crumbs so going to be perfect for dinner tomorrow! I just made this. It was so delicious! I served it with a Mahi sandwich, and I didn't miss the French fries at all. I didn't serve it with the Hollandaise. Instead, I served it with creamy Caesar with a dash of horseradish mustard. Thanks for the recipe! WOW! !I don't think you need me to say how Yummy this looks, but WOW–I am soo making this!! Gorgeous asparagus and the texture is inspired!..Question…could I possibly sub something not wheat-based for the panko bread crumbs? Ground nut meals…coconut flakes…ground oats or flaxseed?..I so want to attempt this, but wish to replicate the "crunch factor" so obviously present in your lovely offering…Thanks for any insight! glutwin: You could use a crushed crunchy rice based cereal as a gluten free substitute for the panko breadcrumbs. This looks really good. I'm always interested in crispy things that are healthier than french fries! Can these be made and then frozen? That is a different way to enjoy asparagus! Anonymous: I would say most probably not, but I have not tried it. They are really delicious with a sauce like Outback's Bloomin' Onion sauce. I used gluten free Panko breadcrumbs on chicken for my son. I bet these Panko bread crumbs would work well on this asparagus. Anonymous: You could use things like milk, buttermilk or even yogurt in place of the eggs. Okay, dumb question are the blanched/cooked first or raw? Anonymous: No the asparagus is not cooked first, it will cook when they are baked. These were amazing and came out just like your picture! I will be making these often. I tried these tonight and they were delicious!!! My husband loved them too and he doesn't care much for asparagus. Crunchy AND tasty….great !!! I made this asparagus tonite and it was wonderful. My husband even loved it and he's not big on asparagus. Crunchy and Tasty!! Hi, I am new to healthy eating, so my question is how is this healthy when the calorie count is 312 for just 2 coated spears? I made it tonight and it was super yummy thank you for sharing this treat with the world! Anonymous: That's 312 calories per serving with each serving being 1/2 pound asparagus. I am glad that you like them! My kids helped me make these last night. Everyone LOVED them, especially my daughter who is a picky eater!!!!!! Very easy to do and became a "Keeper." I liked it even better when dipped in some Ranch dressing. Yum! I just looked through some of your other recipes, too. Can I come eat at your house? I've not found a site that made me this hungry! TY, TY, TY. for sharing all this. kEVIN YOU PHOTOS ARE FABULOUS !!! Sounds so simple and delicious ! My family has tried two of the recipes from your site, and I'm not sure why we haven't tried more. We did this one and the basil chicken one, and they're both SO fantastic. Thanks for sharing… I'll definitely be looking to your site for future meal planning. Kristyn: I'm glad you enjoyed them! I copied this recipe from you a year or two back and I too really enjoy it when asparagus is in season. The Best of Closet Cooking! I came to realize that my meals were boring and that I had been eating the same few dishes over and over again for years. It was time for a change! I now spend my free time searching for, creating and trying tasty new recipes in my closet sized kitchen. Copyright © 2007–2018, Close Cooking Ltd. All Rights Reserved.